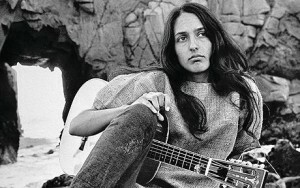 Joan Baez was a folk singer-songwriter who made a name for herself in the 1960s (and then on) performing folk ballads. As the social and political climate heated up in the United States and around the world, Baez became a civil rights and universal nonviolence activist. “As the child of a decade of agitation, her attitudes and life-style evolved so smoothly that she seemed not to have changed at all. Joan blended into the protest tradition, into pacifism, into activism, into a publicized marriage and motherhood, into a vicarious martyrdom, . . . and finally into a national symbol for nonviolence.”1 She had a very appealing voice, which served her well in attracting audiences to her music. To build a dike that will not break? Before we make the waves stand still? How many dead to reach the stars? Starting out on a local scale in California, Baez ended up playing at the Newport Folk Festival in 1960 and then signing onto Vanguard Records for the next 12 years. Baez played many shows internationally and during the Vietnam War, she began playing internationally, including a show in Tokyo, Japan in January 1967. At this show, the translator later admitted that he left out all of Baez’s political comments after being instructed to do so by a man who identified himself as a CIA agent. Instead of interpreting her subtle antiwar sentiments in Saigon Bride, the interpreter told the audience that it was a song about the Vietnam War. It is interesting to see how time and again, governments have feared the strength of a song or piece of art. Instead of listening to something and learning about its meaning and background, we are told to move past that and consume something topically or refrain from interpreting and consuming it altogether. Joan Baez is one of the first recognized folk protest singer-songwriters and someone who has really affected the style of political song today. With singer-songwriters pioneering the political song, it has moved through rock, country, to rap and hip hop. Political protest today takes its form in many ways and the efficacy of that art is dependent on the audience it reaches out to. 1. Rodnitzky, Jerome L. Minstrels of the dawn : the folk-protest singer as a cultural hero. Chicago: Nelson-Hall, 1976. x-87. Print. 2. Baez, Joan. Saigon Bride. Joan, CD, 1967.